Assemble the ingredients as described on the counter. Mix all ingredients except for the feta in a large bowl with your hands. Divide mixture into 4 equal portions. Prepare a large plate with some plastic wrap to cover. Take one portion of the meat mixture and divide in two. Flatten one piece between your hands, trying to keep it evenly round at the edges. Once it is as flat as it can be, place it onto the plastic wrap and place 1 slice of feta over it. The feta should, of course, be smaller in diameter than the meat. 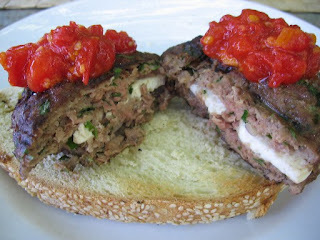 Flatten the other half of the meat portion in the same way that you did the first and then place that over the feta. Now lift the plastic under the whole meat and cheese burger and place it between your hands. With your thumbs, connect the edges of the meat to completely enclose the cheese. Continue this way with the other three portions. Grill or pan fry the burgers as you please. As the burgers are cooking, place the oil in a small sauce pan over medium heat. Add the garlic and allow to turn blonde. Immediately add the tomatoes and simmer for about 5-10 minutes until the sauce reaches the consistency you like best. I cooked mine for 10 minutes and the result was thick enough to dollop on top of the burgers. During the last minute of cooking, add the oregano, salt and pepper. Set aside until the burgers are done. Serve on grilled bread, or if you insist, a sesame seed bun. Pregnancy vitamins don't contain protein. I think the medical establishment figures women in the Western world have no problem getting enough protein in their diets. In fact, most Americans get too much. I don't think I can count myself among them, though. I love starch, sugar and vegetables in that order. Meat is good but I don't really crave it, so here is a working woman's brown bag lunch which is also packed with protein for a growing baby. *Use cayenne, use Thai red pepper-garlic paste, even use Harissa like I did. It was not terribly hot so I ended up adding 3 tsps and could have even added more. Put the chicken breast in the freezer until it has become half frozen. This helps you to cut it into the small, 1/2 inch dice that you need. Place the oil in a large frying pan and add the chicken, garlic, ginger and lemongrass all together and sautee until the chicken is cooked through and beginning to turn golden. Take off heat and let cool. Whisk all sauce ingredients together you will probably want to add a couple teaspoons of water to thin out the consistency. It should be as thick as stirred yogurt. Cook noodles according to package instructions. Once done strain in a collander and do something no self-respecting Italian would ever do: pour cold water over noodles until they are cold. If taking to work, put a portion of noodles in one container and drizzle with a bit of vegetable oil to keep the noodles from sticking. Place all other ingredients in a different container and mix at lunchtime. 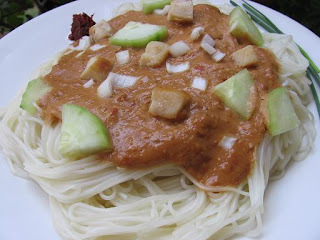 If eating at home, spread the noodles on a plate, pour sauce over them and arrange chicken and vegetables on top. Music to eat Thai Chicken Peanut Noodle Salad or anything else by: punk band, Fugazi and the greatest You Tube video of all time: Waiting Room. Enjoy! During my first trimester, I found that this smoothie calmed my nausea down. Don't know how it worked but I wasn't about to question a good thing. Even if you don't have morning sickness, this smoothie will kill your ice cream cravings while giving you a whollop of calcium and vitamins A and C without all the fat. By freezing the papaya in chunks, you don't have to add ice cubes which water down the smoothie. The result is thick and rich, sweet and creamy. In a very large glass - you need to allow extra room for the blending), place all the ingredients in descending order. With an immersion blender, mix until you have a smooth, frothy, semi-frozen texture. Music to blend your smoothie by: Pete Rock and CL Smooth "Take You There". Enjoy with a straw of with a spoon. Boy has time flown by! Long time no see, huh? One day, I'm cooking up a storm and the next, I'm suddenly all preoccupied with so many other things to think about, plan, negotiate and imagine. Like a good former academic, I've been staring at my belly button for the last few months. You see, my innie is turning into an outie. I'm pregnant!! and that fact has taken up a lot of my creative energy over the last few months, not that I haven't been cooking. 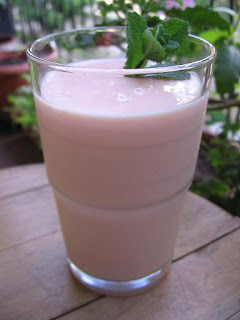 One of these days, I'll give you a fabulous recipe for papaya-yogurt-rose water smoothie that's guaranteed (well, maybe not guaranteed) to make you forget your morning sickness. Then there's the tips on delicious and lysteria-free cheeses. I swear that French goat cheese made with pasteurized milk when eaten with "Cruscarelli" bran bread sticks tastes like the best Cheetos ever without the post-apocalyptic bright orange stains on your fingertips. Anyway, I'll be back soon! After thinking about it for years, making pale substitute dishes (tamale pie, the huge, sliceable tamalòn) and having the right ingredients for months, I finally made real, corn husk-wrapped, pork and ancho-filled tamales. My huge tamale steamer had been doing exclusive duty as a big stock pot*. They took a huge amount of work to make but I think they were well worth it and I'm sure that they'll become one of my many once-a-year cold weather projects. The work is divided into three phases: the "stew", pork shoulder simmered and shredded and mixed with an ancho chili sauce; the dough; and the assembly/cooking so you can interrupt the work between phases if you want to relax. *Actually there's little difference between big stock pots and tamale steamers. Basically the difference is the disk-shaped rack that holds the tamales above the level of boiling water. If you have no tamale steamer, you could rig up a big stock pot with a couple small cups holding up a wire rack for cooling cookies. About 40 corn husks (32 for the tamales, a couple for the strips to tie them with and the rest to line the tamale steamer). Boiled in abundant water in a huge pot and then allowed to soften in same water for 2 hours. Bring 8 cups of water to a boil in a large pot. Add the pork, 2 tsps of salt and bay leaves and allow to simmer partially covered for about 40 minutes. While the pork is cooking, lay the ancho and pasilla chilis open and flat on a hot cast iron griddle. Hold down for about 5 seconds per side with a metal spatula. Once toasted, put into a small bowl of hot tap water. Once all the chilis are submerged, allow to soak for 20 minutes. then pour off the water. Drain the water from the meat and reserve. This now flavorful water will help you make both the "stew" and the tamale dough. Place the drained chilis in the bowl of a food processor. Add the pepper, cumin, garlic, optional chipotle and 2 cups of the pork broth. Blend until smooth. Pass through a medium mesh strainer into a mixing bowl, reserve. Heat 1 tbsp lard in a medium saucepan over medium-high heat. Once the pan is very hot, add all the chili puree in one go. Make sure you're wearing an apron because, this sauce will become angry, fuming, spiting and sputtering. Despite all thins, stir for 4-5 minutes until the puree has taken on a darker shade of brick red and has thickened. Add 1 1/2 cups of broth, reduce heat to medium low, and simmer covered for 15 more minutes. Once finished, add remaining 1 tsp salt and the sugar. 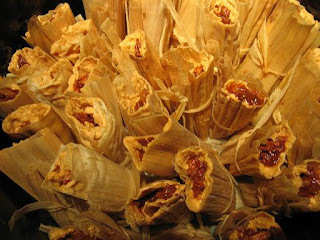 Remove 1/2 cup of sauce to go into the tamale dough and another 1/2 cup to pour on finished tamales. There should be 1 1/2 cups left to mix into the pork. Break up the pork cubes into shreds. Add the approximately 1 1/2 cups of sauce into the shreds and set in the fridge while you make the dough. OR, YOU COULD GIVE YOURSELF A BREAK AND PUT EVERYTHING IN THE FRIDGE OVER NIGHT. NO ADVERSE EFFECTS WILL OCCUR. GO AHEAD, RELAX! In a large mixing bowl, mix the hot tap water into the masa harina and allow to rest for 30 minutes. If you have a hand mixer, your life will be a lot easier than mine for the next half hour. If not, get out the food processor (no need to rinse it since you'll be putting some of the chili sauce into the dough) and place the lard into the bowl. Whizz the food processor or use the hand mixer to beat the lard until fluffy and smooth. I once tried to do this by hand using my sturdiest wooden spoon and some elbow grease but I wasn't able to beat in enough air and the result was soggy and sad. Add the 1/2 cup of chili sauce and incorporate. Begin to add 1/2 cup-sized bits of the reconstituted masa while you beat. If you have a hand mixer, you'll do just fine but your food processor will probably whine and complain like mine did once most of the masa has been incorporated. When most the reconstituted masa has been incorporated into the dough, or when your food processor starts to show signs of stress, add some of the total 1 cup of pork broth that will eventually go into the dough. Whew! Ya still with me? Music to work your fingers to the bone by: "Hot Tamale" by Mr. Vegas. Continue to alternate masa and broth additions until everything has been added. Now, you're ready for the final step, add the baking powder and salt, and beat into the dough for about a minute to made sure they have been evenly distributed. At this point, a good test of future success is if a bit of your dough floats in a glass of cold water. Tamale assembly: If you've been powering on in the same day from start to finish, you should already have been soaking and softening your corn husks for 2 hours. If not, boil them for 10 minutes, keep covered and go watch a movie while they soak. Otherwise, set up your whole corn husks, dough, "stew" and 1/4 inch wide strips of some of the smaller corn husks for tying and the tamale steamer with some extra corn husks already lining the rack and several inches of water at the bottom. Take one whole husk, flatten out on a plate with the wide end toward the right. With a rubber spatula scoop up about 3 tbsps of the dough and spread in a 4 inch square at the edge of the wide end of the husk with at least 1 1/2 inches of empty husk on each side. Then place 1 1/2 tbsps of the "stew" in a line down the middle of the dough square. Take up the empty sides of the husk and bring them together thus enclosing the filling with the dough. Fold the empty sides over to one slice and fold up the empty bottom. Tie with a corn husk strip and place open top up along the wall of the tamale steamer. Continue this way (you'll get a feel for it after a couple) until you have made about 32 tamales and you've finished your ingredients. The last tamales tend to be very heavy on one ingredient and light on the other depending on how you proceeded previously. Lay all tamales standing up and leaning against each other on the rack. 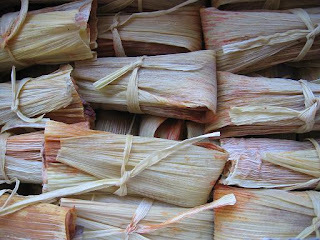 Cover the tamales with any remaining whole corn husks. Moisten 2 kitchen towels and lay them along the edge of the steamer. Place the lid on tightly over the towels. They should help keep a seal on the steamer and help keep insideous dripping into the open tamales. Place over a high flame to get the water boiling quickly, then once it boils, lower it to medium-low and steam for 1 hour and 15 minutes to 1 1/2 hours. Watch carefully so that all the water doesn't boil away. Once the tamales are done, take them out and unwrap a couple, pour a bit of the re-heated chili sauce over them and enjoy! They reheat perfectly. Just re-steam or microwave them until hot. After such an auspicious beginning tasting rosemary lemonade for the first time, I decided to try rosemary and lemon in another combination: marmalade. After all, my stores of blackberry and fig jam are getting thin, I'll need new stuff to spread on my morning toast. 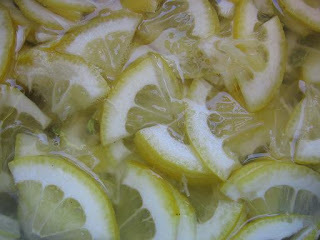 I think it is important to use organic lemons here since you use all the zest, so it's best if it hasn't been sprayed. I haven't given much information in the way of quantities since this recipe works in ratios. Place the lemon slices in a non-resctive saucepan. I happened only to use 2 lemons. Just barely cover with water. Cook over low heat for 1 hour. Cover and let stand for at least 4 hours or overnight. Measure the amount of fruit pulp and liquid you have. I had 2 cups. Place pulp mixture back into the pan. Add as many cups of sugar as you have pulp into the pan. To that, add 1 tsp of chopped rosemary leaves per cup of pulp and fruit pectin as per package directions. I added 1/4 of a package given the small amount I made. In a different saucepan, place the canning jars and their lids, cover with water and bring to a boil. Once the canning jar water begins to steam (before it boils) put your lemon, sugar, rosemary mixture on high heat and stir frequently. Once the marmalade has been boiling for about 5 minutes, you can begin to test it's doneness. Place a drop of marmalade on a cool saucer. Wait a minute or two to allow it to set. Draw your finger through the drop and if the two sides remain separate (do not run together), it's done. Take a jar out of the now boiling water and fill to the rim with the marmalade. Repeat with as many jars as needed. If the jarring has been done right, the marmalade will keep for more than a year. There are other methods that have you filling and sealing the jars before you boil them. I've never tried that, but it may be an effective method as well. When the mood strikes you, open up a jar and spread on toast or even maybe some roast lamb. 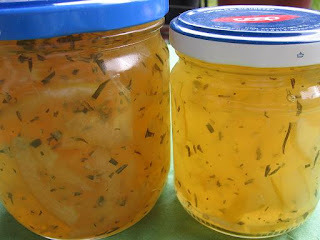 Music to eat lemon rosemary marmalade by: "King for a Day" on the release, Oranges and Lemons by XTC. Place into a spray bottle. Saturate leaves in the morning so they have a chance to dry out in the afternoon sun. 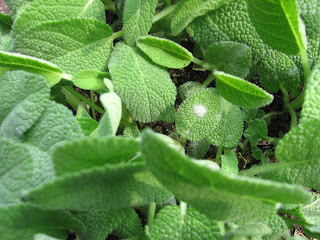 Since powdery mildew thrives in moisture, you want to limit the time the leaves are wet. Also, if possible, water the plant from the bottom by filling the saucer with water. So, this seems a bit paradoxical. You should spray with a water solution to get rid of powdery mildew but you should keep the plant's leaves dry to retard powdery mildew growth. I dunno; for now that's the best I got. Now if anybody out there has any better home remedies, please let me know.